Rating = Snowstorms must be greater than 1 inch of snow. 1 Nov. 7th & 8th Trace Event 1 No A few snow flurries between 1900 to1945 temperature 41.6 °F to 41.8 °F and again 2100 to 2110 temperature was 41.1 °F Then after midnight on November 8th there was another period of very light precipitation between 0130 and 0140 that was not observed but though to be another snow flurry. 2 Dec. 29th Trace Event 2 No A little sleet mixed with rain occurred at the onset of precipitation at 03:35. 3 Jan. 17th 3.0 Storm 1 Yes There was almost one inch of rain before the snow started. The temperature was never lower than 32.5 °F during the snow. The ground was warm and added to the melting. There was about 0.72 inches of liquid that fell after the rain turned to snow. It would have been a 7.0 inch snow if the temperature was lower than 28 °F. It was a wet slushy snow with large flakes giving an uneven surface. The snowboards on the ground never read more than 2.7 inches but the snowboards with an air space beneath them read 3.0 inches at 10PM on the 17th. The snow stopped quickly about 10:05 PM. and by midnight the total had dropped to 2.7 inches. The snow was completely melted by the afternoon of the 21st. 4 Jan. 23th & 24th 0.7 Event 3 Yes This snowfall was from a clipper from the NW and was the opposite of the last snow, a very dry and fluffy snow with little moisture. The snow started as snow pellets at 2213 and lasted only two minutes. Then at 2255 a continuous snowfall started and lasted through midnight until 0140 and stopped. At 0325 another round of snow occurred and lasted until 0605. There were a few light snow flurries in the early morning but nothing close to an accumulating snow. The water equivalent was only 0.03 inches water in the 0.7 inch snowfall a ratio of 23.3 to 1 a very dry snow for West Henrico Co. - Glen Allen area . 5 Jan 25th 0.7 Event 4 Yes Fast moving system gave only about four hours of snow. It started at 1341 and ended at 1750 and was again a very dry cold snow with temperatures in the low 20's °F . The snow ended with snow needles. It has been a long time since I have seen snow needles they are rather rare. There were also stellar crystals and spatial dendrites because of the low temperatures aloft and at the surface. The water equivalent was only 0.04 inches water in the 0.7 inch snowfall a ratio of 17.5 to 1 a dry snow. It was an easy snow to measure with little wind and a very even snow surface. 6 Feb. 2nd 0.1 Event 5 No More of a conversational snow that started around 1745 and ended at about 1900. The hardest part of the snow shower was around 1800 to 1830. The snow was just enough to measure but didn't have enough moisture in it to measure. 7 Feb. 3rd T Event 6 No Another conversational snow that started around 8:40 AM and ended at 08:45 AM. Then started again at 0945 AM and end at 10:45 AM more snowflurries. The temperature went above the freezing mark at 09:28 AM. The two snows of Feb. 2nd and 3rd gave 0.01 inches of moisture. 8 Feb. 16th 0.1 Event 7 Yes This event started as rain at 0015 and turned to snow at 0650 a total of 0.04 inches was recorded before the snow started and from 0710 to 0730 the snow was moderate but was melting as it fell. The maximum accumulation was 0.1 inches around 0740 AM. All the snow melted then around 1615 another snow shower gave almost another 0.1 inches on the snowboard. If you didn't have a snowboard you might have given this event only a trace amount as the ground was so warm from yesterday's sun and a maximum temperature of 64 °F. The temperature was above the freezing mark during all of the snow period. If the temperature was 29 °F during the snow period we could have gotten 1.2 to 1.5 inches. 9 Feb. 22nd T Event 8 No A a very small amount of sleet that was mixed with rain except for a short period at the onset. 10 Mar. 6th 3.7 Storm 2 Yes Rain started to change over to sleet around 0530 and by 0800 was all snow. There was approximately 0.5 inches was sleet and about 0.4 inches that was a mix of snow and sleet before becoming all snow. Highest snow total was 3.5 inches between 1115 and 1130 but the total for the day was 3.7 inches as the snow melted back to about 3.0 inches before getting an additional 0.2 inches. At 1115 hours a core sample taken and 0.95 inches of water was in the 3.5 inches of sleet and snow a very heavy mix of wet snow and sleet giving a liquid to snow equivalent of 1 to 3.7. Total rainfall to midnight of the 5th was 0.39 inches. Total of rain, sleet and snow for the 6th was 2.25 inches or a storm total of 2.64 inches. Thunder was heard 7 times during the early morning at 631, 645, 806, 817, 821, 830, and 835. The first two lightning strikes occurred during the heavy period of sleet. You could call it a thunder-sleet storm until about 0700. 11 Mar. 17th-18th 1.1 Storm 3 Yes This was mainly a sleet storm. It started with a short period of heavy sleet at 2100 hours then turned back to rain until 2147. The precipitation continued as sleet until 2300 when it started mixing with a precipitation from looking a little like snow pellets that showed heavy riming. The maximum amount of frozen precipitation (1.1 inches) occurred at 0430 before the precipitation changed to rain. 12 Mar. 21st 0.1 Event 9 No This early morning snow shower was a very short period of light snow. But the temperature soon went above freezing and most of the snow was gone but 0900. 13 Mar. 24-25th 4.7 Storm 4 Yes This had the most intense snowfall rate of any storm this past winter. Between 1805 and 1905 1.9 inches of snow as large aggregates or fluffy assemblages of many crystals and caused a rapid deterioration of road conditions and many accidents. This increases the air spaces in the snow and increases the snow to water ratio and also increases the settling rate. 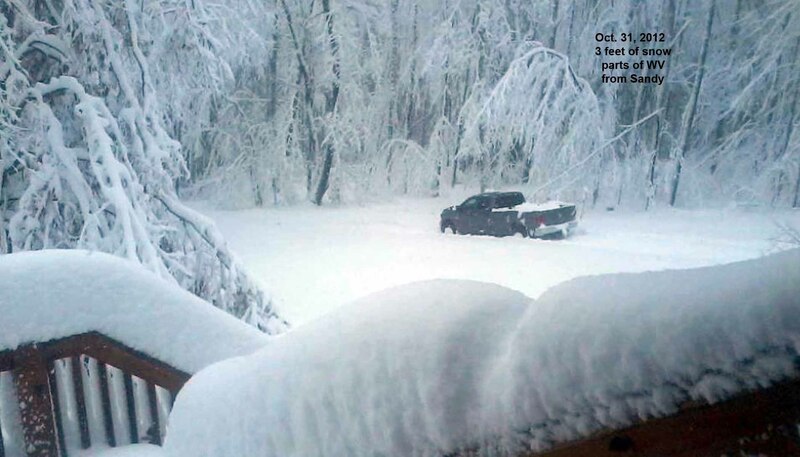 The most snow on the snowboard during the storm at any one time was 3.9 inches at 2010 on the 24th. This same snowboard used on the 24th had only 3.6 inches of snow the morning of the 25th even though an additional 0.8 inches had fallen since midnight because of melting and settling. On the morning of the 25th the additional 0.8 inches of snow was recorded on the second snowboard that was put out to catch any snowfall after midnight. Thus during the night there was 1.1 inches of melting and settling of the snowfall. A core sample on the morning of the 25th showed 0.47 inches of liquid water in the remaining 3.6 inches of snow. The snow camera shows only 3.0 inches as the heat of the light on the snowboard during the night caused 0.6 inches of additional melting and settling. The total snowfall during the storm was 4.7 inches and the total water content was 0.57 inches of which about 0.7 inches were rain on the morning of the 24th. This storm gave more snow than any of the storms during the winter season.